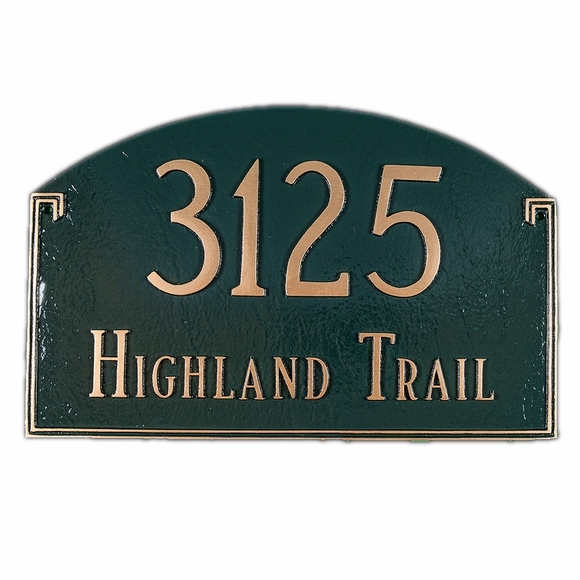 Arch Address Sign - - personalized arch shape address plaque. Thin double border the three straight edges. Made in the USA. Available in two sizes: standard 16"W x 10.25"H"W and estate 25.25"W x 16.5"H (estate wall sign shown in large image). Order with one line of personalization for large numbers or with two lines of personalization. Standard sign holds five (5) 4" characters on one line OR two lines with five (5) 3" numbers on Line 1 and seventeen (17) characters on Line 2. Estate sign holds five (5) 7" characters on one line OR two lines with five (5) 5" numbers on Line 1 and seventeen (17) characters on Line 2. Personalized with your address and color scheme selection. Border color repeats the address color. Sold with or without two optional 24" lawn stakes. Dimensions: 16. "W x 10.25"H and 25.5"W x 16.5"W.
Solid cast aluminum construction. Characters and border are integral components of the sign, not added on. Made in the USA.